Do you want to get into the holiday spirit? The Savannah Harbor Festival of Lights is no doubt a spectacular holiday adventure. It’s a drive-through light experience that showcases at least 80 larger-than-life displays. There are surprises hidden behind every twist and turn, including additional events and entertainment! Make sure you get a copy of our complimentary Vacation Guide to start planning your holiday stay. When Is the Savannah Harbor Festival of Lights? Presented by the Savannah Harbor Foundation and Savannah Morning News, the annual Savannah Harbor Festival of Lights spans from the end of November to the beginning of January. This is prime time to get into the holiday spirit and enjoy all our other holiday activities in the city! Bundle up and get ready for a true holiday event. The Savannah Harbor Festival of Lights is a fun family event, full of twinkly light displays! Kids and adults alike will be awestruck by the hundreds of bright lights displayed across 2 miles of land. We here at the Presidents’ Quarters Inn want you to enjoy the Savannah Harbor Festival of Lights to its fullest. Grab your blanket and thermos of hot cocoa and head over to the Annual Savannah Harbor Festival of Lights for an evening you will never forget. The event is full of many wonders. Guests start their journey through the winter wonderland with a warm welcome from the Festival’s warm Gate Ambassadors. Drive through 1.5 miles of giant lighted holiday displays, from Santa and his sleigh to Rudolph and his friends. After driving through the excellent light show, make your way over to the Winter Carnival and continue the fun. The Ferris wheel overlooks the beautiful Savannah River and River Street. Wander around the Carnival and grab a treat at one of the numerous concession stands. With choices between s’mores, hot chocolate, hot dogs and more, you are sure to find something that satisfies your palate. Huddle around the warm bonfire while you roast your s’mores and enjoying the holiday music that fills the air. This is a holiday experience that you don’t want to miss! One of the best parts about the festival is that it’s for a good cause. The Festival of Lights and the Savannah Harbor Foundation raises tens of thousands of dollars each year. Charities that have been donated to in the past include Bethesda Academy, Interfaith Hospitality Network, Greenbriar Children’s Center, and Lowcountry Down Syndrome. As you are planning your evening at the Savannah Harbor Festival of Lights, make sure you have a cozy place to which to return after the evening out. 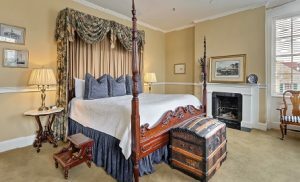 The President’s Quarters Inn offers a selection of lovely rooms and suites, which are all elegantly decorated to match the southern charm of the city. Before you head out into the beautiful winter day, you will get to enjoy a delicious, complimentary breakfast. We look forward to seeing you!